Cobalt has been used for thousands of years as a blue coloring agent in pottery, glass and ceramics. However, in recent years demand from more high-tech sectors has emerged — today cobalt is used in batteries, alloys and more. The battery sector in particular has become an important source of cobalt demand. Demand for lithium-ion batteries, which require cobalt, is surging, and this demand is expected to drive the cobalt market in the coming years. At the same time, cobalt supply could tighten substantially due to human rights abuses in the Democratic Republic of Congo (DRC), where most cobalt is produced. There’s also been speculation about a possible civil war as well as an ebola outbreak in the DRC, leading to more talk of supply shortages on the horizon. Given those factors, many investors are now wondering how to invest in cobalt. To help those interested in the sector, we’ve put together a brief guide on cobalt supply and demand and different investing options. Read on to learn more about this exciting critical metal. Cobalt is mainly produced as a by-product of nickel and copper, and as mentioned the DRC supplies the bulk of the world’s cobalt. Most cobalt in the DRC comes from an area known as the Copperbelt. It holds one-third of global cobalt reserves and accounts for 40 to 50 percent of cobalt output in the DRC. The DRC produced 64,000 MT of cobalt in 2017, far ahead of Russia’s 5,600 MT. The Eastern European nation was the world’s second-largest cobalt producer that year, while Australia and Canada were the third and fourth largest, respectively. Cobalt is currently produced in about a dozen countries worldwide. As noted above, cobalt from the DRC is facing increasing scrutiny. While cobalt is not officially a conflict mineral, some human rights groups are pushing for it to receive that designation. Many DRC cobalt operations are dangerous and poorly managed, and these groups believe that cobalt end users should be sourcing the metal elsewhere. Cobalt demand is also important to look at. It’s tough to say exactly how much demand for the metal will increase in the coming years, but many experts agree that growth will be substantial. As noted, the lithium-ion battery market will be a huge driver of that demand. Lithium-ion batteries are used in electric vehicles, as well as other electronics. The consensus seems to be that those supply and demand dynamics will push the cobalt market into deficit in the coming years. Macquarie has said that a deficit of 885 tonnes is expected in 2018, with a deficit of 3,205 tonnes anticipated in 2019 and a 5,340-tonne deficit on deck for 2020. Those circumstances have begun to push cobalt prices up, and have left many investors interested in cobalt investing. 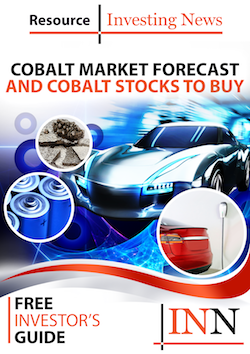 As CommodityHQ notes, there are two main ways to invest in cobalt: futures and stocks. Cobalt futures can be found on the London Metal Exchange under the ticker (CO). These futures began trading in early 2010 and are quoted in US dollars per tonne. Contracts range over a span of 15 months, allowing investors to make bets on the metal over varying time periods. “I think the key for smaller companies is to be targeting value-added products further downstream than simply a concentrate, such as cobalt sulfate, targeting the battery supply chain,” he added. Our overviews of TSX-listed and TSXV-listed cobalt companies that have seen year-to-date gains include a number of larger companies with exposure to cobalt, as well as some smaller companies looking to break into the space. They are a good place to start for those who are new to the space.